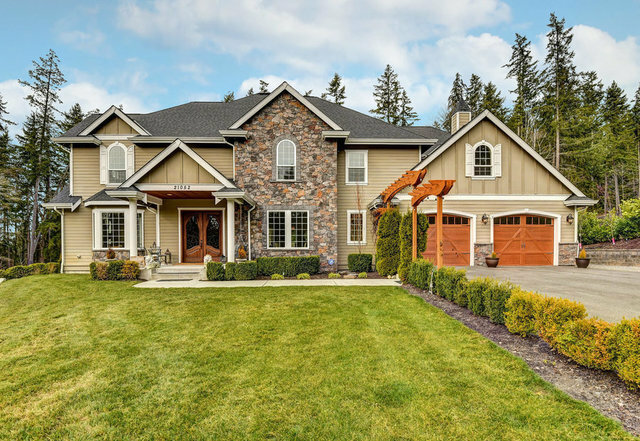 Stunning custom built home on just shy 2 acres in Redmond. Gorgeous grand entry features winding staircase with pass through railings and dazzling glass blown chandelier, luminating the beautiful vaulted ceilings. Floor to ceiling windows in main living area provides substantial natural light, bringing the outside in. Gourmet kitchen with granite countertops, double oven, gas range and immense island with eating space. Partial mountain view in the office and full bath on main floor. Master bedroom with en suite, jetted jacuzzi tub, heated flooring, gas fireplace and huge stall shower with double shower heads and jets. Gigantic walk in closet, craft room and work out area also included in the en suite. Heated floors in full guest bath and laundry room on 2nd level. Fully finished basement with movie theatre, large living space, humidity controlled wine closet, 5th bedroom, full bath with heated floors and storage room. Large deck off main floor, perfect for outdoor entertaining and watching the evening sunsets. Expansive yard with fully fenced garden space, chicken coop and storage shed. Four car garage with built in pet wash.